American Development Co.: Hurricane Season is Here! June is the beginning of hurricane season for the East Coast and the Gulf of Mexico, areas where tornadoes and floods have already brought historic devastation this year. According to an article on yahoo news, “Hurricane season is also predicted to be a doozy, and like clockwork, a storm is already brewing in the tropics. Forecasters are monitoring a low-pressure system off the coast of Georgia and Florida. If it intensifies, it could become the first of this year's named storms (which include tropical storms and hurricanes), which are predicted to be more active than usual. In their forecast released today for the 2011 Atlantic hurricane season, atmospheric scientists at Colorado State University in Fort Collins call for 16 named storms, nine hurricanes and five major hurricanes (category 3 or stronger on the Saffir-Simpson scale). The forecasters predict an "above-average probability of United States and Caribbean major hurricane landfall," according to the forecast. The forecast covers the Atlantic basin, which includes the East Coast, the Caribbean Sea and the Gulf of Mexico, from June 1 to Nov. 30. Last month, the U.S. National Oceanic and Atmospheric Administration (NOAA) released its forecast, predicting between six to 10 hurricanes, three to six major hurricanes (those with winds of up to 111 mph (179 kph) or higher) and 12 to 18 named storms. The 2010 season was one of the busiest ever, with 12 hurricanes in the Atlantic — the second-highest number on record, tied with 1969 — and 19 named storms, a tie with 1887 and 1995 as the third-busiest on record. Five of last year's hurricanes reached major hurricane status (Category 3 or higher on the Saffir-Simpson scale of hurricane strength). An average Atlantic season produces 11 named storms, six hurricanes and two major hurricanes. The busiest season on record remains 2005, which saw 28 named storms, including Hurricane Katrina. Several climate factors will play a role in this year's hurricane season, including a warm Atlantic Ocean, where sea surface temperatures in areas where storms often develop and move across the Atlantic are up to 2 degrees Fahrenheit (1.1 degrees Celsius) warmer than average, according to NOAA. 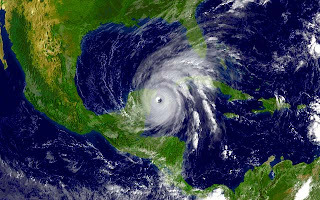 An ocean-atmosphere phenomenon called La Niña, which results in a cooling of the equatorial Pacific Ocean, has been linked to an increase in hurricane activity for the continental United States and the Caribbean. A strong La Niña was in effect earlier this year, and though it continues to weaken and is expected to dissipate later this month or in June, its impacts — including reduced wind shear, which can cut off a developing storm — are expected to continue into the hurricane season, according to forecasters. Forecasting if and where the storms will make landfall is "next to impossible," said Jane Lubchenco of NOAA in a press conference last month, and this year's forecast does not make any predictions about landfall, which is driven by weather patterns at the time the storm approaches. None of last year's storms made landfall in the United States, but Mexico and earthquake-ravaged Haiti got clobbered. No hurricanes have made landfall in the United States since 2008, when Hurricane Hanna, a Category 1 storm, hit South Carolina. The last major hurricane to hit the United States was Hurricane Wilma, a Category 3 storm, which struck Florida at the end of the monster 2005 season." “How do I find an apartment in Playa del Carmen?